FANBOY PLANET.com . : mc-iron-man-experience-hong-kong :. Hong Kong Disneyland Gets The Iron Man Experience! Tom Staggs announces anyone in Hong Kong can be in the armor. From the second Disney bought Marvel, fans have waited for a Disney attraction to feature Marvel characters. For a variety of legal reasons, their stateside hopes have been delayed, but across the Pacific, it's finally going to happen. 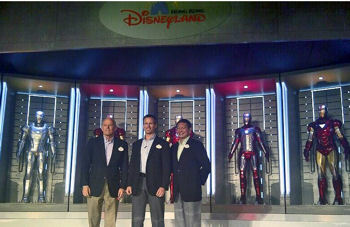 At Hong Kong Disneyland, Chairman of Parks and Resorts Tom Staggs appeared at the Hall of Armor, an exhibit similar to the Stark Expo at Innoventions in Disneyland in Anaheim. But he wasn't there to try the Kinect-like armor up simulation. Instead, he announced the first Disney/Marvel ride -- the Iron Man Experience. Details are a little sketchy at this point, but concept art shows a vehicle similar to the Star Tours "Ship," but Iron Man-themed. So obviously, it won't be a roller coaster, but a simulator. Though I'd bet that Disney is going to raise the bars on simulators; they have stiff competition from Transformers the Ride over at Universal, and this is their chance to blow that away. Scheduled to open in late 2016, the Iron Man Experience will, of course, also feature a gift shop and a chance to meet and greet Iron Man himself. So when will the States see something like this? Keep watching Anaheim, because it still can't happen in Orlando. But Disney can't keep U.S. bound fans waiting too much longer... can they? Comment on our Facebook page!